Zucchini (Courgette) Quiche, Thyme for Cooking late summer gourmet tart. The rice makes a lovely crust, much healthier than the traditional pastry... and easier too, especially if you cook the rice earlier. I used little pear-shaped tomatoes. Cook the rice in stock. If doing in advance, refrigerate until needed. If doing now, spread the rice on a plate to cool for 5 minutes before making crust. Mix cooked rice, 1/4 cup cheese and egg. Bake in 400F (200C) oven for 8 minutes. Slice zucchini into 1/4" (.5cm) rounds. Add zucchini slices and sauté until transparent and tender. Remove to a plate. Add onions and mushrooms and sauté until onions are tender. Remove from heat. When crust is done, remove from oven. Spread the onions and mushrooms evenly over the crust. Arrange the zucchini slices on top in a single layer. Lay ham on top of zucchini and sprinkle with 1/2 cup cheese. 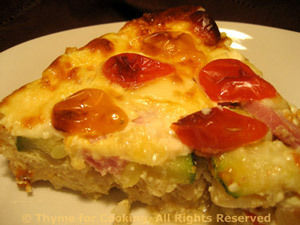 Arrange the tomatoes, cut side down on top and bake, 30 minutes, 400F (200C). Quiche is done when center no longer 'jiggles' - it doesn't need to be solid but should be fairly firm. Note: I usually put the quiche dish on a baking sheet to make it easier to handle – it gets kind of full.